This pattern developed in North Eastern Spain, mainly Barcelona, during the nineteenth century. The shape of the cup symbols, like egg cups, is distinctive and a move away from the earlier baroque traditions in Spanish playing cards. The figures also have more natural proportions with youthful faces and bland expressions, to the extent that in many cases they are devoid of any personality. The characteristic Ace of Coins shows a central female bust in profile, within a wreathed and crowned circular frame. This is mounted on a low platform carrying symbols of commerce and prosperity - barrels, cornucopias, anchors, etc., with flags draped at the sides. 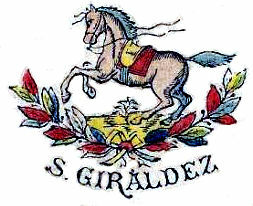 The Modern Spanish Catalan Pattern has become well-established in South America as well as in Spain. 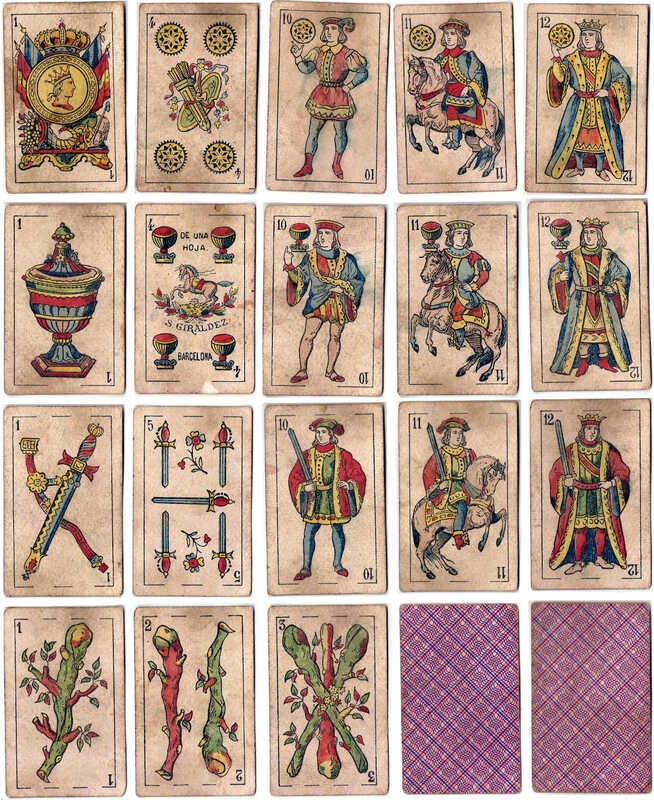 Above: standard Catalan pattern Spanish-suited playing cards by S. Giráldez, Barcelona, c.1905. 40 cards, hand-coloured. The ace of coins shows a cornucopia and an anchor, symbolical of maritime trade and abundance, with flags draped either side of a medallion. In this design the kings are clean-shaven.